The Core Team stayed close to home base these past few days, but there’s no way I could let the weekend wave of migrants wash over without dipping my toe in a little. Central Park has been flooded by both songbirds and bird watchers, with new species of the former being tallied by the latter almost hourly. The outer boroughs are experiencing an abundance of avifauna as well, or so the listserv tells us. It got me to wondering…why can’t I enjoy spring migration in my local park? After all, I live in the northwestern corner of the Bronx, not far at all from either Manhattan or Westchester County. 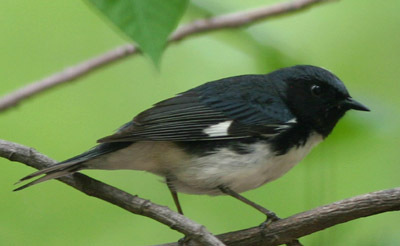 Our neighborhood strip of Hudson River greenspace is but a stone’s throw from Inwood Hill Park, one of the finest places to observe spring passerines in all of the city. So why not check out the birds of Riverdale Park? With the notable exception of our first Eastern Screech-Owl sighting, Riverdale Park has failed to impress. While it does boast an impressive frontage on the mighty Hudson, it lacks a certain density. The park is a mere ribbon of wood sandwiched tightly between wildly expensive real estate and the Metro North railroad. It offers neither the habitat diversity of New York City parks like Prospect Park and Van Cortlandt nor the vertical splendor of Inwood Hill. Riverdale Park also wants for attention; while other city spaces are monitored almost obsessively, Riverdale Park is forgotten by city birders, frequented only by normal citizens, the types who look at someone with binoculars with wary curiosity or bemusement. So, while experience and logic dictated a meager medley of species, my theory was that, during this most wonderful time of the year, the good birds would be there. Let everyone else chase after the warblers downtown. This park is mine and mine alone! Anyway, if I was wrong, I could always go down to Central Park next week. I visited the park once on my own for a couple of hours on Saturday and returned for another hour with Sara on Sunday. The first birds I was confronted with with on the approach to the southernmost entrance of Riverdale Park were the usual ones. House Sparrows and European Starlings in their multitudes seemed infected with the blithe spirit of the season, singing and displaying just like normal birds. Blue Jays, Northern Mockingbirds, Northern Cardinals, Common Grackles, American Robins, Rock Pigeons, and Mourning Doves were also hard to miss, as usual. I noted with pleasure that Gray Catbird numbers have surged to their warm-weather levels, which is to say ubiquitous. I then promptly resolved to ignore their mewling cries until summer. Once I reached the entrance, my thesis bore fruit. A few Yellow-rumped Warblers zipped through the trees on my way to the park, but they’re just too common to get excited about at this time of year. They are, however, at the height of their considerable charms right now, buzzing about in their breeding frenzy. But right there at the entrance, the handsome Black-throated Blue Warbler above called to prospective partners, entreating them to consider a life in this fine, tall tree he’d laid claim too. Frankly, the prospect doesn’t seem promising; though this fellow is a fine specimen indeed, his home gets too much foot traffic. Other males were at least smart enough to carve out territories deeper into the woods. Now, a mere ten warblers in early May might be considered underachieving by some, but I should remind you that this spot is not exactly conducive to power birding. The sightlines are pretty poor, and anyway, I was the only one looking. But warblers weren’t the only songbirds passing through. I noted my first Scarlet Tanager, Baltimore Oriole, and House Wren of the year, two resplendent beauties and one subtle one. I also admired a flock of Cedar Waxwings platoon a tree high above me; they appear completely different when all you can see are their pale yellow underbellies and stubby, squared-off tails. Brown-headed Cowbirds with their catchy copper domes competed with House Sparrows for productive space along the road. Last but far from least, I spotted two birds high in the canopy that I’d never seen before, the beauteous but bashful Blue-headed and Philadelphia Vireos. Too bad Sara wasn’t with me for them! So, I can say with certainty that Riverdale Park is a fine place to pick up a few spring songbirds. It’s beautiful, quiet, and remarkably free of birders, no mean feat for a city park in May. If you live in the neighborhood, you could certainly do worse. That being said, if you don’t live here, you could do much better. Take a look at the tallies from Central Park and you’ll see what I mean!